Farmhouse rustic interiors are offered for reasonable prices at the newly opened Rustic Market, as well as boutique items by way of clothing and jewelry. Finding a little something special just got a bit easier for shoppers looking to find fashion and style on a limited budget. Be it home décor, a last-minute gift or a little something special to wear out with friends the newly opened Rustic Market may just be the stop to fulfill those needs. Located at 132 N. Yosemite Ave., Oakdale, the frontage window facing Highway 120 has proved to be a great draw for the family-run business. Store hours are Tuesday to Saturday, 10 a.m. to 5 p.m., and Sunday 11 a.m. to 4 p.m. Opened in September, owners Rod and Jeanne Riley, along with her daughter Ashley Powell have been pleased with community response thus far. “I just want to try and make it a one stop shop,” Jeanne Riley said of the business. 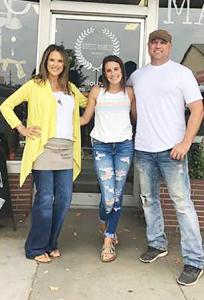 Inspiration for the store came from the couple’s love of farmhouse design and their own travels as they looked throughout the Central Valley for home items. Riley shared much of her shopping was done in Turlock, which prompted her to explore bringing something similar to the 95361. The North Yosemite shop offers vintage farmhouse décor, candles, a sleek jewelry assortment, as well as a small offering of clothing. “We like to offer boutique style clothing, so there’s only so many of one item and once that’s gone, it’s gone,” Riley stated. She also shared she and her daughter Ashley prefer to shop uncommon companies, so that they can offer unique options with limited quantity to their customers. Now just less than one month into the business, they already have a top seller and are anxious for the re-order to replenish. “The biggest seller has been the magnetic bracelets,” Riley said of stylish bracelets which cleverly self-close by magnet. Rustic Market owners Jeanne and Rod Riley joined by Ashley Powell, center, are the business owners and operator of the newly opened North Yosemite business. Jeanne and daughter Ashley are the two primary faces greeting customers at the local boutique. Personal fashion, however, is not the only thing which prompts customers to return. The popular trending farmhouse style of rustic art, wood signage, pillows, candles and home décor items throughout the shop are enough to inspire even the uncertain in search of a fresh new home look. Riley indicated that the local merchants have been just as welcoming as the customers, offering a true sense of business camaraderie, which is both heartwarming and appreciated. 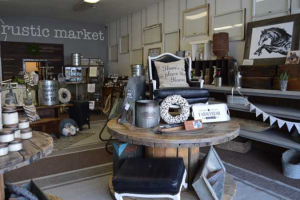 Rustic Market offers a number of additional services at the store, including custom signs, custom gift baskets and antique windows for home décor.